Fresh air, the countryside, flowers, animals, an aquarium, an ancient tree and visions of ancient warriors guarding the castle. And, did we mention beer? This is Nago City,. 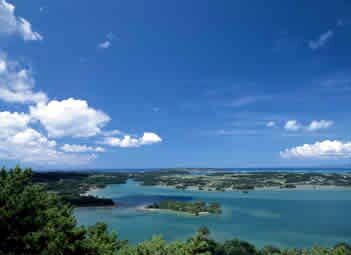 It is located a half an hour drive north of the Okinawa Expressway, which begins at Naha and ends at Kyoda. There is a lot to see and do on the island’s north side, more than can be experienced in a single day. Nago and its immediate vicinity offer a variety of activities that will please even diverse family interests. For most visitors, a half-day provides a cross section of insights. The city sits on a gentle sweeping curve wrapped around the Nago bay. Within the heart of the city there are several see-and-do experiences. 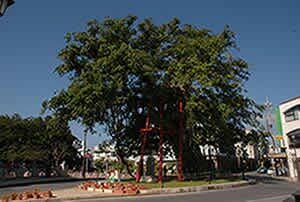 The symbol of Nago is the ancient banyan tree that sits In the heart of the city, its sprawling, drooping branches telling its three hundred years of history. Nearby is the Nago Museum, which is open Tuesday through Sunday 10am-6pm. It is a quaint, small museum that chronicles Okinawa’s now disappearing ancient ways of life. It doesn’t take long to visit, and costs only \150. While in the downtown area, an unusual sightseeing stop is the Orion Brewery, home to Okinawa’s principal local beer. Free tours are available, but you must call in advance at 098-052-2137 to make arrangements. The beer is good, and the brewing process fascinating. Still in Nago is the trip up Nago Castle Hill. While most everyone flocks to the area in February, when the cherry blossoms are breaking into full bloom, the hillside is beautiful year around. Take the road northeast from Orion Brewery, along the river. You have choices now. Walk up the countless sets of stairs to the top of castle hill, where only a few ruins and sight markers remain. The castle is gone, but memories of Okinawa’s Ryukyu Kingdom past abound as tourists soak in the view across Nago Bay. There’s also a Children’s Park near the mountain top, along with scenic overlook towers and rest facilities. We mentioned choices. You can also drive to the top, stopping at any of several narrow parking areas. There’s more to northern Okinawa than simply the city itself, although the dedicated tourist can find many things to do that will occupy a day, or even a full weekend. There’s Meio University, one of Okinawa’s newest in Nago. And north of the city there is Neo Park, an adventure particularly for youngsters. Within a half-hour’s drive of Nago there are several enjoyable ways to spend a morning, or afternoon. Most can occupy a full 3-4 hours, or more. The Ocean Expo Park in nearby Motobu Town is growing in popularity, largely because of its world class aquarium, but also because of several other fascinating attractions. 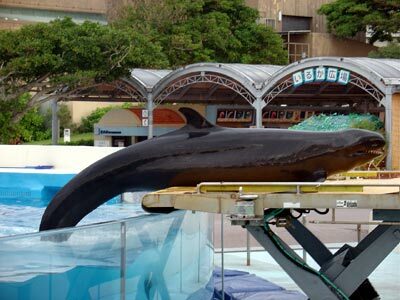 Churaumi features the world’s second largest fish tank, showcasing a wide spectrum of fish, including the false killer whale. There are dolphin shows, hands-on exhibits for children, turtles, sharks, and much more. Those other spectacular exhibits and attractions? You’ll want a couple hours at the Butterfly House. You’ll also want a couple hours walking through Tropical Dream Center. And of course, Ocean Expo Park itself has a museum and other exhibits. Traveling back to the east on the Motobu peninsula north side, toward Nakijin, plan to stop and view the Nakijin ruins, and then continue on to the Pineapple Orchard and Winery. Great photo opportunities, and good tasting pineapple, pineapple cakes, cookies and candies, and pineapple wines.